ISRAELI TEL AVIV NEOCONS = POSE A DEEP THREAT TO AMERICA’S SURVIVAL = USA MUST BREAK ITS RELATIONSHIPS WITH ISRAEL. ISRAEL IS AN ANTI-AMERICAN EVIL = TIME FOR A TOTAL USA DIVOCE FROM ISRAEL AND SAUDI ARABIA | Concise Politics -- Your Time should NOT be wasted. ISRAELI TEL AVIV NEOCONS = POSE A DEEP THREAT TO AMERICA’S SURVIVAL = USA MUST BREAK ITS RELATIONSHIPS WITH ISRAEL. ISRAEL IS AN ANTI-AMERICAN EVIL = TIME FOR A TOTAL USA DIVOCE FROM ISRAEL AND SAUDI ARABIA. Ahmad’s BOOK is Enormously significance and relevance = “The Road to Iraq” = Tremendous intellectual diligence and moral seriousness and major contribution to central events of this century — aftershocks still unfolding daily, to disastrous effect. Ahmad’s Book shows ISRAELIS AIM WAS PURELY TO USE USA’s MIDDLE CLASS WEALTH AND RESOURCES TO DESTROY AN ENEMY = SADDAM AND IRAQ with ECONOMIC EXPLOITATION SECONDARY. SO USA TOPPLED AND MURDERED Saddam Hussein for ISRAEL = $6 TRILLION COST TO USA MIDDLE CLASS = NEARLY MURDERING IT COMPLETELY. FACT: DESTROYING IRAQ = Significantly strengthened Iran = NEOCONS NEXT TARGET using NETANYAHU against Obama. ISRAELI LOBBY = Institutional Infrastructure = Infiltrated USA GOVERNMENT + Bush Administration + The Pentagon with Wolfowitz and Douglas Feith + Office of VP with Lewis “Scooter” Libby controlling Cheney + Infiltrated CFR and Created many Think Tanks to dominate State Dept & Defense. Former New Republic editor Andrew Sullivan SAYS ISRAELI NEOCON GROUP = “is about enabling the most irredentist elements in Israel.” = Likud-Zionist-centric. ISRAELI CRIMINALS = ALREADY MURDERED LIBYA + EGYPT AND NEXT? ISRAELI CRIMINALS NOW WANT = TO MURDER Syria + Iran + Russia but corporations oppose fiercely. Muhammad Idrees Ahmad’s new book on 2003 invasion of Iraq = Reveals neoconservative intentions = Zionist Neocons were its architects and chief Media Proponents. TORTURE REPORT = CIA torture by Bush-Cheney = Cast of NEOCONS who engineered the 2003 Iraq invasion. Ahmad on Oil = “If Iraq was invaded for oil then the US was remarkably negligent in securing the prize.” = Iraq’s first oil concession (2009) = Norway, France, China and Russia. Naomi Klein Shock Doctrine = Sees Iraq as disaster capitalism = Exploiting a society convulsed by shock and awe. Klein conflates neoconservatism and neoliberalism—two distinct doctrines. FACT: IRAQ war = Disaster for world capitalist system. = “World will be paying for the Iraq war for a bloody long time” — Joseph Stiglitz and Linda Blimes demonstrated in $3 Trillion (NOW $6 Trillion) Dollar War: The True Cost of the Iraq Conflict. #1 Results for USA = A Catastrophe on MANY LEVELS = Attacking Iraq was a minority position in US officialdom = Opposed the war = Colin Powell’s infamous LIES and DISTORTIONS to the UN on the eve of the invasion = BUT Not only Powell but virtually the entire state department + Swath of the military and intelligence establishments, opposed going to war. 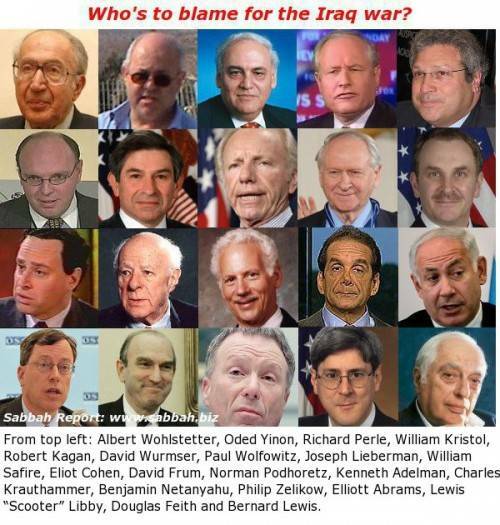 #2 War party was a Minority faction paved by neoconservatives architects = NYT Thomas Friedman told Israeli Haaretz (April 2003): “25 people (MADE) the Iraq war” happen. ISRAELI Neocons were obsessed for decades with toppling Saddam’s regime. 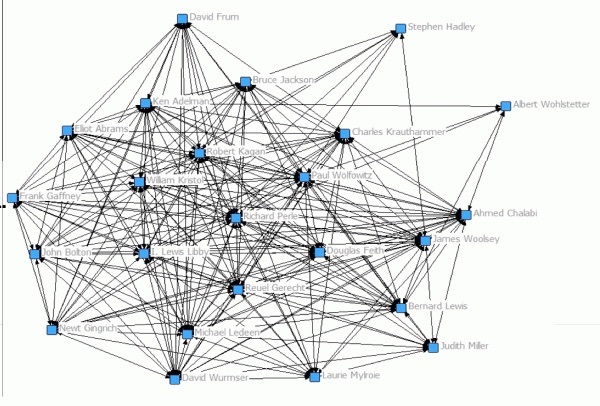 ISRAELI NEOCON CORE = Richard Perle’s dense network = Direct one-to-one relationship with every other member of the network. ISRAELI NEOCONS = “succeeded in using the shock and disorientation of the attacks to place Iraq…on the agenda and helped manufacture the case for invading it.” — Ahmad writes NEOCONS were preoccupied with Iraq and urged going to Baghdad immediately after 9/11, never mind Afghanistan. ISRAELI NEOCON = Deputy defense secretary Paul Wolfowitz argued to ATTACK IRAQ four days after 911. Donald Rumsfeld + Cheney = Metamorphosis from traditional conservatives to NEOCON champions = Pivotal in DRIVING to go to IRAQ war. #1 Why were ISRAELI NEOCONS so determined to OVERTHROW SADDAM? #2 How did this ISRAELI NEOCON Faction OVERRIDE its MANY Rivals? #2 is answered by Ahmad’s chapters on “Setting the Agenda” and “Selling the War” = Well crafted familiar ground told by other books also. #1 is answered well by Ahmed = He explanes the motivation of the ISRAELI NEOCONS crusade against Saddam Hussein = Ahmed’s real contribution. TEL AVIV inspired and conceived the NEOCONS WAR ON SADDAM = VERIFIED by Political scientists John Mearsheimer and Stephen Walt, book “The Israel Lobby and US Foreign Policy” = Two preeminent realist scholars in international relations theory, maintain that both Israeli leaders and the Israel lobby in the US urged the Bush administration to invade Iraq AGAINST USA geostrategic interests BUT saw in ISRAEL’S interests. Ahmad shows ISRAELIS AIM WAS PURELY TO USE USA’s MIDDLE CLASS WEALTH AND RESOURCES TO DESTROY AN ENEMY = SADDAM AND IRAQ = Creating 3 weak failed states for with later ECONOMIC EXPLOITATION was a SECONDARY GOAL. Anti-Zionist Israel Shahak observed = “Strategically, Israel is obviously a huge burden for the U.S.” = Clear to more and more in the US foreign policy establishment. The question some grapple with is = IS USA CULPABLE FOR FALLING IN LINE WITH ISRAELI CRIMINALS = OF COURSE “THE STUPID GOYIM” (Jews call Non-Jews) ARE CULPABLE OF MASS MURDERING FOR ISRAEL MASS MURDERES! QUESTION: WHY DID “STUPID GOYIMM LIBERALS” fall in line with ISRAELI CRIMINALS? Ahmad’s section titled ‘From humanitarian intervention to shock and awe’, he takes them to task for forging a “neoconservative-liberal alliance” in support of the 2003 invasion = “easing the inhibitions of some about the use of force.” BUT MANY SMART LIBERAL GOYIM FOUGHT THE NOECON BULL CHIOT. Ahmad = Arguments against the Principle of Humanitarian Intervention = he concedes there are “crises where predatory states use the cover of sovereignty to tyrannize vulnerable populations.” BUT USA USES IT TO TOPPLE FOR ISRAELI CRIMINALS WHO DO WORSE MASS MURDERS AND OVERWHELMING VIOLENCE! CONCLUSION: ISRAELI TEL AVIV NEOCONS = POISE A DEEP THREAT TO AMERICA’S SURVIVAL = USA MUST BREAK ITS RELATIONSHIPS WITH ISRAEL. ISRAEL IS AN ANTI-AMERICAN EVIL.= TIME FOR A TOTAL USA DIVOCE FROM ISRAEL AND SAUDI ARABIA. This entry was posted in ISRAELI TEL AVIV NEOCONS = POISE A DEEP THREAT TO AMERICA'S SURVIVAL = USA MUST BREAK ITS RELATIONSHIPS WITH ISRAEL. ISRAEL IS AN ANTI-AMERICAN EVIL = TIME FOR A TOTAL USA DIVOCE FROM ISRAEL AND SAUDI and tagged ISRAELI TEL AVIV NEOCONS = POISE A DEEP THREAT TO AMERICA'S SURVIVAL = USA MUST BREAK ITS RELATIONSHIPS WITH ISRAEL. ISRAEL IS AN ANTI-AMERICAN EVIL = TIME FOR A TOTAL USA DIVOCE FROM ISRAEL AND SAUDI. Bookmark the permalink.